Last year we helped our SCCA customers process more than 2000 weekend memberships online rather than having the participant fill out a triple-carbon form at the event during registration. It saves a ton of time, keeps lines short and removes one more paperwork roadblock to having fun. 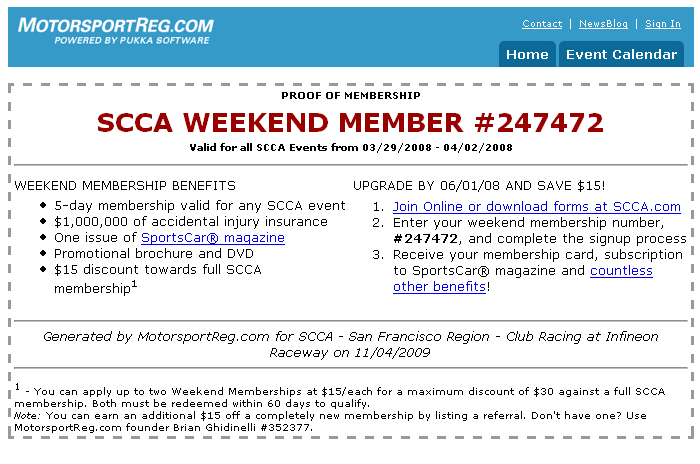 If you are an SCCA region and aren't familiar with how to sell weekend memberships in advance, check out the overview. In addition to the front-end benefits, remitting memberships electronically eliminates data entry errors, illegible handwriting and lost forms so both the National office in Topeka and the local registrar wind up with the same count when it comes time to bill the region for the memberships. This also increases your memberships as each weekend membership sold through MSR receives a nice certificate and an upsell as to why they should join the SCCA. 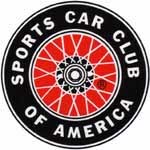 We even link directly to the join page on scca.com. While our submission process has worked reliably, due to time constraints on our customers, the data isn't always remitted in a timely fashion. This has led to some confusion at the National office as to the event and time frame for the membership, which impacts when it can be redeemed for a $15 credit towards a full annual membership. To solve these problems, we worked with Colan Arnold to add three more fields to our online registration form, which include the name and type of event and the SCCA sanction number(s). We automatically populate the name and type and ask that registrars fill in the appropriate sanction numbers in order to help the National office improve their reconciliation and billing.